Master Chris Holmes has been studying various martial arts for over 22 years. He started training in Tang Soo Do with Christian Shoemaker while attending USM in 1995. Master Holmes then joined the Tylertown Tang Soo Do academy in 1997. Training became a way of life and he has consistently trained with the best instructors he could find since he first started in 1996. Master Holmes currently holds the following ranks: 5th Degree Black Belt in Hanminjok Hapkido under Grandmaster In Sun Seo, 5th Degree Black Belt in Jujitsu with the USJA, 3rd Degree Black Belt in Han Mu Do under Dr. He Young Kimm, 2nd Degree Black Belt in Tang Soo Do, 1st Degree Black Belt in Brazilian Jiu-Jitsu under Carlos Machado, and Black Belt in Judo. He is currently serving as Director for the World Kido Federation and Hanminjok Hapkido in the state of Mississippi and he is the official RCJ Machado Jiu-Jitsu Representative for Mississippi. Master Holmes' first instructor Christian Shoemaker said this; "I've known Mr. Holmes since 1995. In that time, I have seen him grow tremendously as a martial artist. From a technical perspective, he is one of the best instructors I have worked with. His work ethic, desire to teach, and enthusiasm for seeing his students’ progress have always been phenomenal. It has been my honor and privilege to know him these last 20 years." Master Instructor Christine Holmes has been studying the martial arts for 15 years. She currently holds the ranks of 4th Degree Black Belt in Hanminjok Hapkido under Grandmaster In Sun Seo, 1st Degree Black Belt in Han Mu Do under Dr. He Young Kimm, and Purple Belt in Brazilian Jiu-Jitsu under Carlos Machado and Professor Chris Holmes. Mrs. Holmes has excelled at teaching all ages but her Lil' Dragons Program is truly remarkable because of the skills she is able to teach them. This class is for 4-6yr olds, it teaches them the basics such as falling, kicks, punches, and a few throws. The focus of this class it to teach them basic martial art skills in addition to manners, teamwork, and life skills. They will be taught: home safety, stranger awareness, vacation safety, fire safety, traffic safety, weather safety, basic first aid, basic health concepts, and basic anti drug concepts. This class is for 7-12 yr olds, it teaches the fundamental requirements for Hapkido and Judo through orange belt. They will learn falls, kicks, strikes, throws, and some joint locks. They will also be taught some Verbal Judo, anti bullying concepts, stranger awareness, and other life skills. The focus in this class is getting them ready for Hapkido and Judo. They also are required to do community service to earn their next belts. This is invaluable in cultivating leadership skills that they will need in the future. This is our core class for kids and families. This class teaches our students the core requirements of Hanminjok Hapkido as taught to us by Master Steve Seo. They will master their kicks, punches, and core hoshinsul(self defense techniques). In addition they will learn the core throws of Judo from a self defense and sporting perspective. More in-depth community service projects are required for belt promotion in this class as it is grooming our future community leaders. The BJJ/Judo classes are designed to teach our students ground fighting as taught to us by Grandmaster Carlos Machado and his brothers. We focus on creating an ego free environment where adults and teens can test themselves and grow while working as a team. Our students that decide to compete do very well in the tournament circuit. Our judo program supplements and enhances our BJJ. Judo means the gentle way. It was developed in Japan by Jigoro Kano around 1882. O Sensei Kano took techniques from multiple jujitsu systems and combined them into his own system which he called Judo. The two guiding principles of Judo are maximum efficiency with minimum effort and mutual welfare and benefit. He eliminated the techniques of jujitsu that were the most dangerous and this allowed his students to train at a much higher level in relative safety. 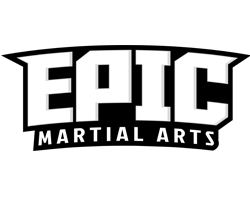 Here at Epic our Judo team is our competition team. Hapkido tournaments are almost impossible to find and Jiu Jitsu tournaments are not always safe for younger students. The competition Judo team allows them to tap into their competitive nature in a reasonably safe environment. Please provide us some contact information.